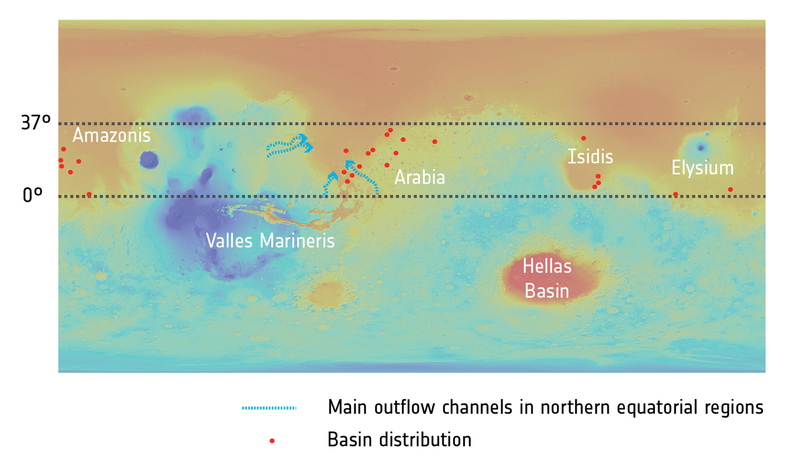 This image shows the distribution of a number of deep craters (marked as dots) recently explored as part of a study into groundwater on Mars. The background image is shown in colours representing topography: reds and oranges are lower elevations, and blues and greens are higher ones. The study found that the floors of the basins, which sit over 4000 m deep, show signs of past water – the first geological evidence that the Red Planet once had a system of interconnected groundwater-fed lakes that spanned the entire planet.